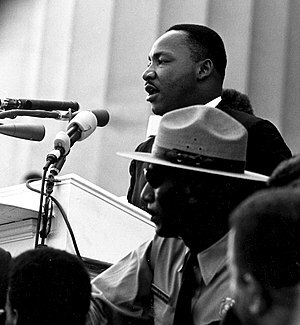 English: Dr. Martin Luther King giving his “I Have a Dream” speech during the March on Washington in Washington, D.C., on 28 August 1963. How big is your dream? Is it real enough to get you working on making it happen? Do you have a dream? Can you paint a word picture of your dream? Can you communicate that vision with passion and get your loved ones to embrace it too? What is the next step that you need to take to make that dream a reality? My friend Carole Ann’s dream was to appear on the BBC’s Woman’s Hour, a few weeks ago she realised her dream. Another friend, Christine, has a dream to live and work in France, she is currently negotiating on a property there and using her contacts to develop a business when she gets there. My daughter had a dream to get a first for her undergraduate dissertation and, having achieved her goal, has been invited to speak on the topic at a university conference. These people were specific about their dream. They shared it with others and they made it happen. My dream is to have a B&B come training centre where people will come to recharge their batteries and learn something new. Business people will come to develop their business ideas and turn them into plans. Individuals will come to learn a new hobby or skill. I’m planning to achieve that dream within the next five years when my children will have finished their education. Now I just have to get complete buy in from my husband! If you have a dream you may need money to make it happen. To celebrate The Training Pack’s 21st birthday I’m launching a 21 day Make Money Challenge on September 21st, why not join us? Each day you will get one challenge delivered to your inbox. It will take between 20 minutes and an hour to complete that day’s challenge and at the end of the 21 days you will have a plan to make your financial target. This is not a get rich quick scheme but a specific way to grow your business or to make money for a good cause (even if that is swelling your own bank account!). There’s no charge. It is my gift to you to celebrate our 21 years in business. Just fill in your details below and we’ll send your first challenge on September 21st. This entry was posted in Business development, Personal development, Small business advice and tagged BBC, France, Martin Luther King, Vision, Woman's Hour by glendashawley. Bookmark the permalink.